I’ve been doing some sewing and it feels so good!!!!! I have been working on a new schedule for myself and it’s working pretty good so far. I am managing to fit in everything I want to, within reason of course. I decided to give it the name “The Ruffles Behind Dress.” It was inspired by an Anthropologie sweater dress from last winter. And I must confess, after I made it, I did try to see if it would fit me (well, before I put the ruffles on). Unfortunately, it didn’t fit. So, I am definitely going to make me some shirts with the same idea behind it. I just adore how it looks on my daughter. I made it a bit larger than the first one because I want it to last longer. I used three old shirts of mine to create it, still trying to stick to the “don’t buy anything unless I absolutely have to” plan. The little decided to spice her dress up a bit too! Let’s start by creating a pattern (or use one you already have). 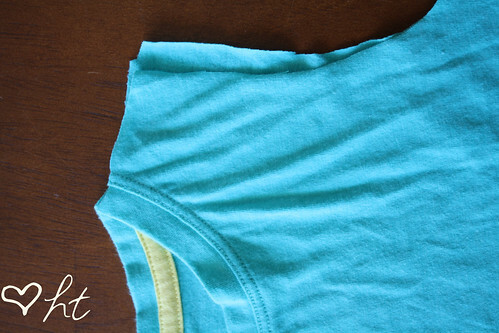 I started by grabbing a t-shirt (I used one that was a little big so it would come out big and I wouldn’t have to worry about adding seam allowances). 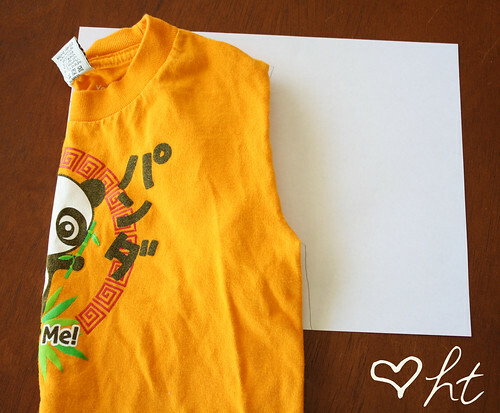 I folded the sleeves in and traced it on paper. Make the top part as long or short as you like. I cut out two, with one having a little bit extra in the middle so I could tape it together for one big piece. 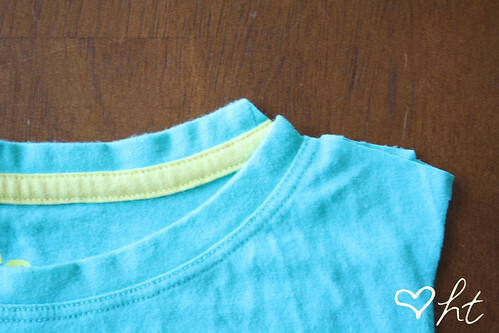 *NOTE: You could make this part a lot easier and use a shirt that fits them already. 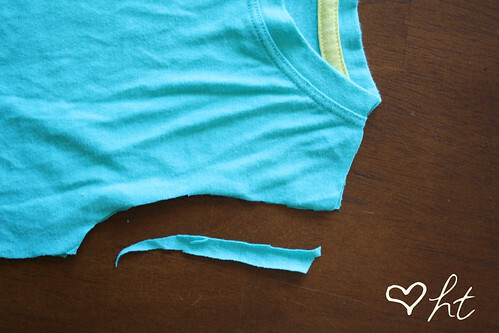 Just cut off the sleeves and use that as a pattern. 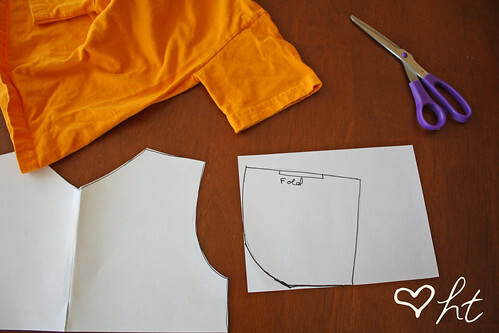 And cut down the sides of the shirt to make the other sewing parts easier. 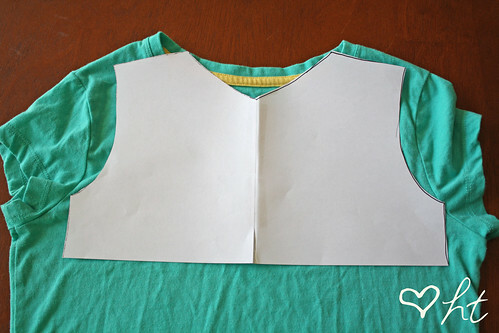 Leave the shoulders sewn together though and make sure to chop off the bottom half of the shirt. To create the bottom, draw a line as wide as the bottom of the top bottom. Then draw lines straight down from each side. Make it as long as you want the dress bottom to be. 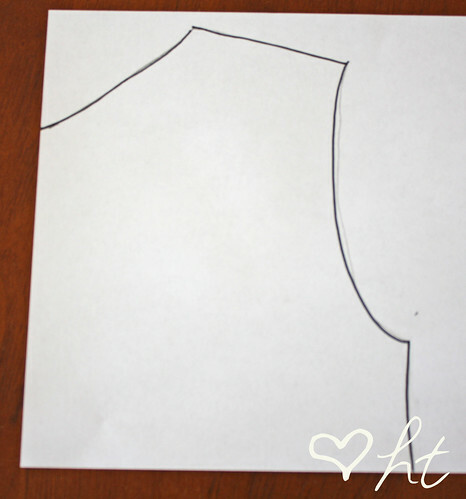 Then, draw a line over on each side to create an A-Line (I did 2″, but make longer for bigger sizes and smaller for smaller sizes). 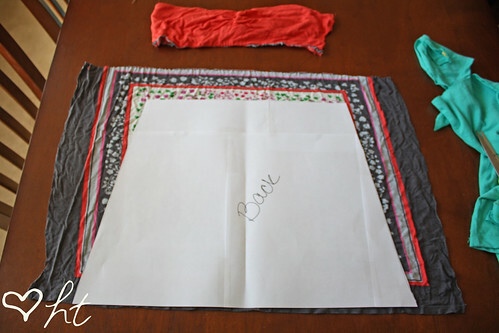 Then draw lines to connect the top of the skirt to the bottom (it will be slanted to make the a-line). Then create a triangle in the very center. I made mine 6 inches at the bottom and had it meet at the center point of pattern. 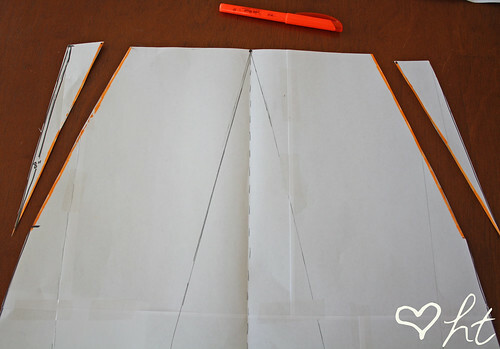 Now you will create a small triangle on the top sides. Just make it the size you want. Mine goes down 8 inches. 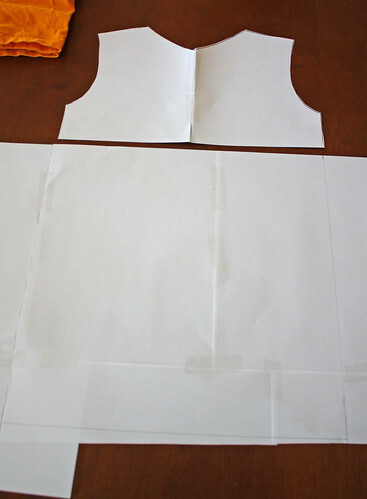 ****NOTE: Before cutting it up, make one more piece this same size for the back, which won’t be cut up. 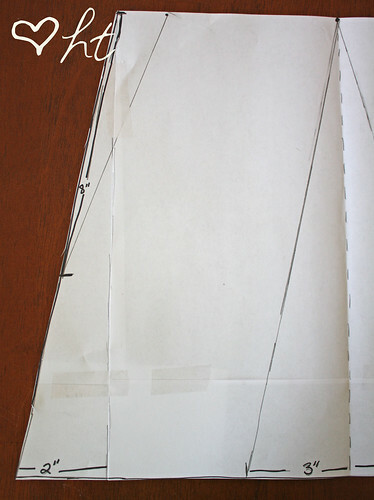 Now begin to cut up the front pattern piece. I highlighted on the edges that were cut to remind myself to add seam allowance. DON’T FORGET Seam Allowances. For the sleeves, I just trace the curve of the front pattern piece and use an existing shirt sleeve for the length and size. 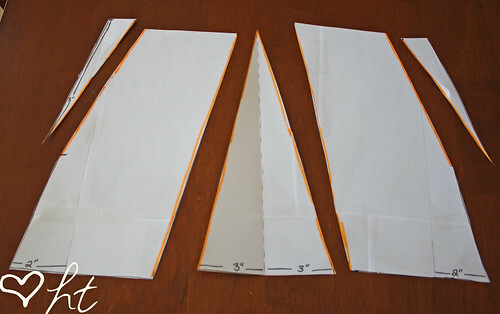 The top of it can be cut on the fold for easier cutting. 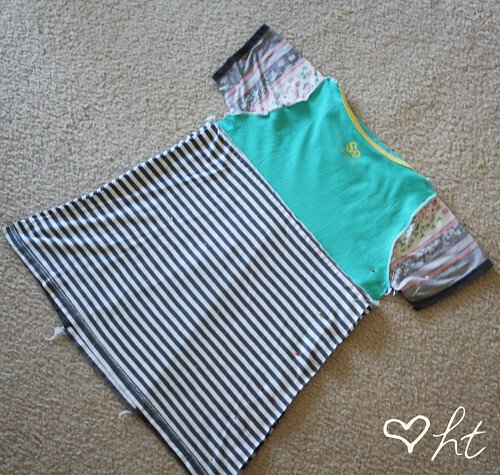 Next I took the top piece and placed it on a shirt and cut it out. The neckline didn’t exactly line up, so next time I would cut each side of the shirt out separately, but it’s an easy fix. Just match up the neck and you will see one side over hang. Just trim off the excess. 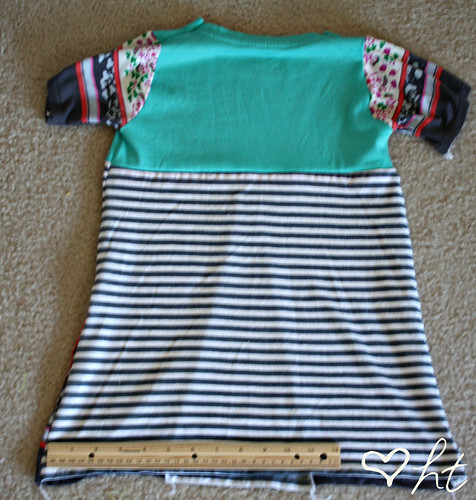 The the bottom pieces, I suggest placing right on the bottom hem of a shirt so you won’t have to hem it at the end. Cut one whole piece for the back. 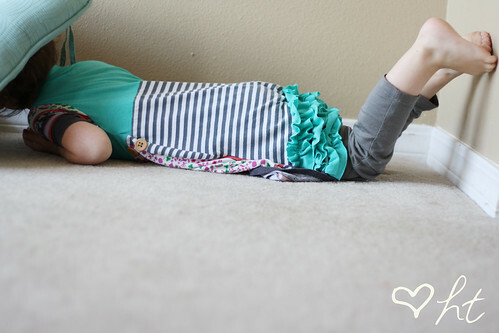 (For her dress, I ended up using the striped shirt instead). Cut 2 sleeves for the dress. 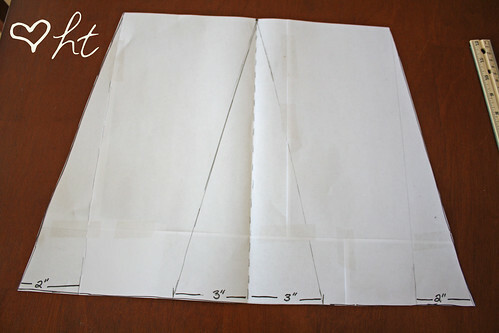 Place the pattern on the fold and have the end of the sleeve on an existing hem so you won’t have to do that either. 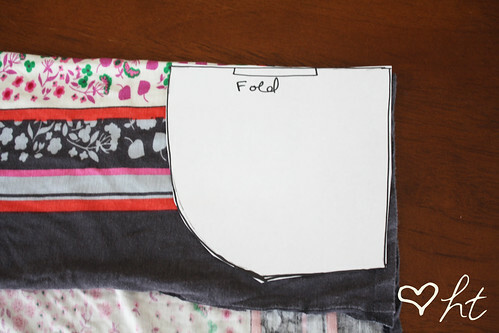 Cut out all of your pieces for the front and sew together. 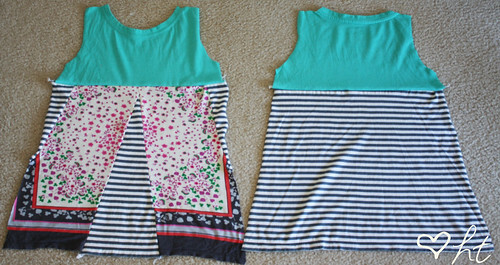 Then sew the front top to the front bottom and the back top to the back bottom. 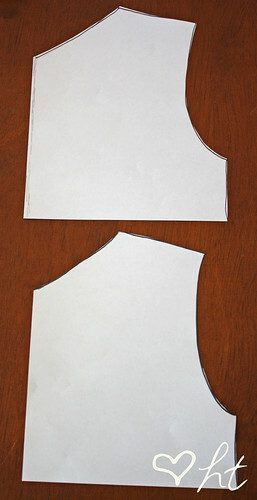 Place front and back right sides facing and sew the shoulders together. Next, pin on the sleeves to each armhole, right sides facing, and sew in place. 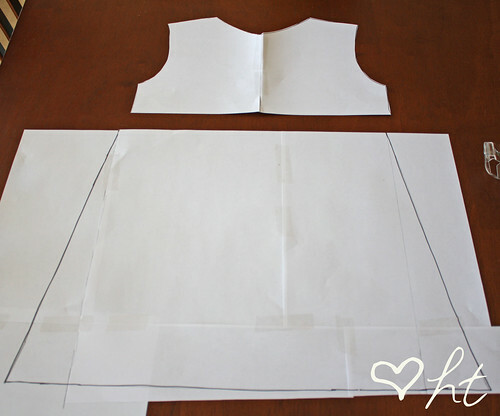 Place dress right sides facing and match up the sides of the sleeves and dress. Pin in place and sew together down the sides. 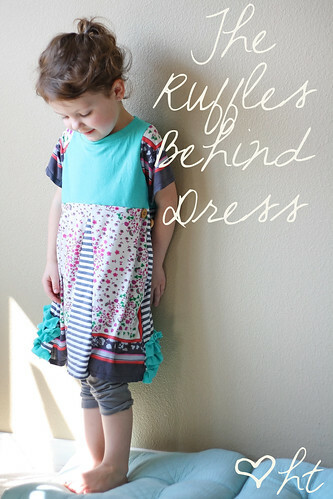 For the ruffles, measure the bottom of the dress. 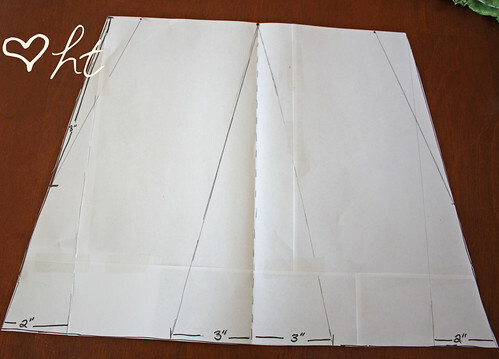 You want to cute pieces for the ruffles that are about twice as long as what you measured. You might have to sew some pieces together to do this. Make the pieces as high as you want. Then baste down the center of the strips of fabric for the ruffles. Gather them and pin on dress. Sew in place. Remove thread from basting. Sew on two buttons to the sides if you like as well. I loooove this 🙂 question for ya… how well do the ruffles hold up in the wash… do they curl reeeeally bad? I want to make about 20 of these 😉 well, I have to see how many old shirts we have first! Well, I have never had a problem with that actually. I think the thinner the knit the more it might do that. Air drying might help prevent it from curling up too. She is so beautiful and the dress is so special with her!!! Thank You for this idea and tutorial!!! I want one for myself too! 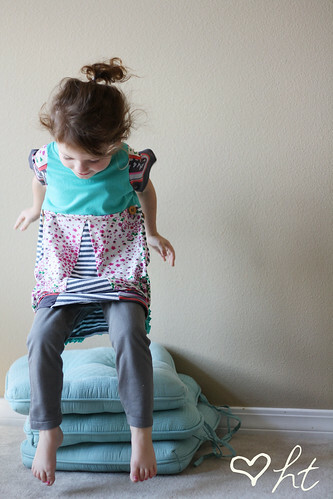 It would be super cute and comfy over leggings…I really love the handkerchief you used for your daughters dress! I LOVE this!! 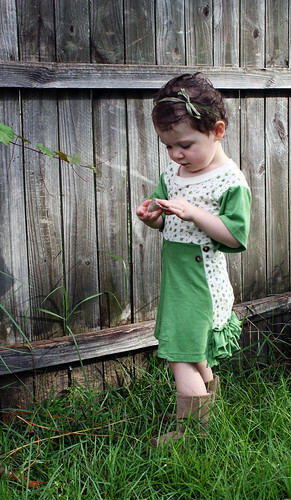 I get the catalog Chasing Fireflies and have been hunting for ideas on how to make several of their dresses that have the ruffles in the back. Thank you for the tutorial. You are inspiring me!! Super darling! Great mix of colors and patterns. She is so lucky! This dress is so fun! Yay! I have always adored this dress! It is so cute. Well, all of your stuff is adorable. 🙂 Thank you! This is adorable!!! 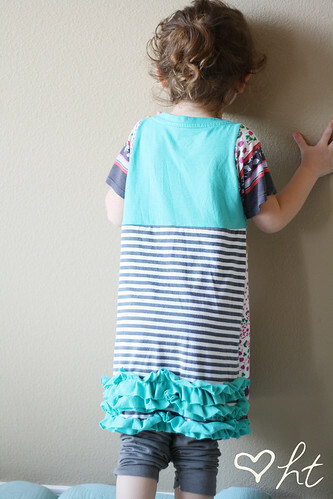 I love the derruffles! Thanks for sharing! And here she goes again! Sharing something AWESOME so we can do it too. I have mentioned this before. But, I must say it again. You are so stinkin’ talented! I love All of your work and I love to see updates from you. 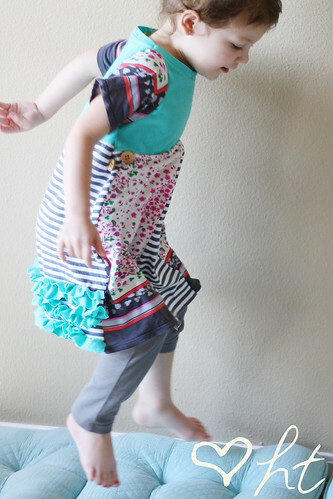 When I first started the whole making your own clothes for the girl, I stalked LilBlue and Happy Together for tutorials and inspiration. My little girl is the same age as yours, and it has been such a joy watching them grow. I hope someday you can come to Kentucky for a move. That would be GREAT. Take care and I am so glad to see your settling in so wonderfully. P.S. You should share your scheduling technique with us, and thanks for always keeping it real. 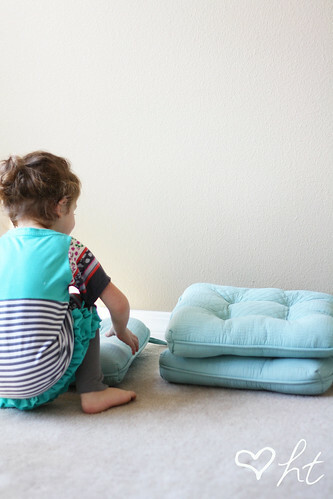 This is a very nice tutorial!Thank you for giving us all these gorgeous pictures and instructions! I really appreciate it. Thank you for sharing this. It’s darling and very creative. Great idea. I love the way it came out! Thank you for sharing this tutorial! Your dress is SO cute!! 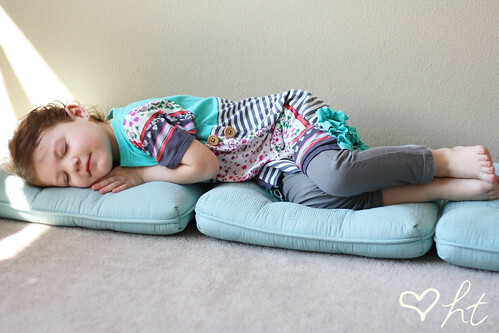 I think I may need to make one for my little niece. 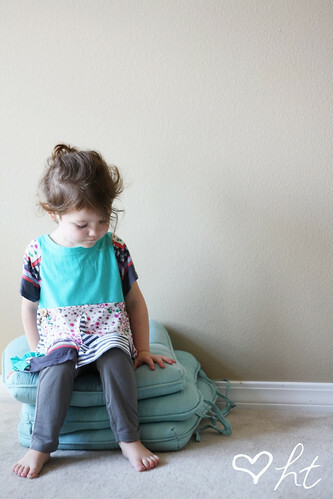 This dress looks so adorable on your daughter. 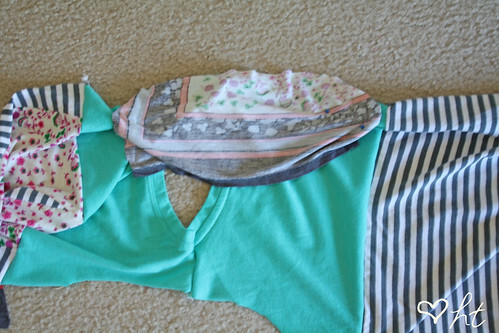 I love the fact that you’ve used old shirts and things that you already had on hand. Great job! 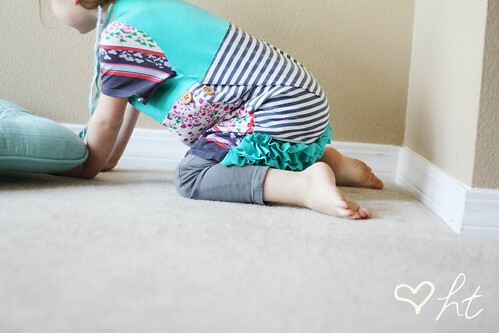 Little ruffle bum babes sure are the cutest! Love this! Absolutely adorable! I’ll have to make several for the nieces for Christmas. Thanks for the tute! this is soooooo cute great fabric choise!!! Gonna save this in my album to make! LOVE LOVE LOVE this.. 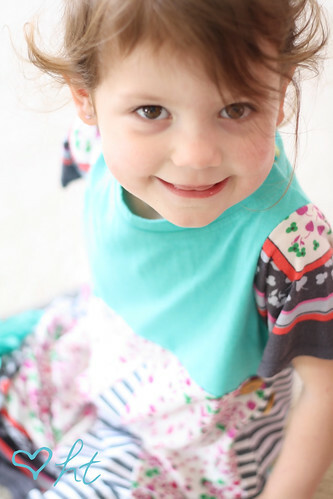 I am going to make some for my little one!!! 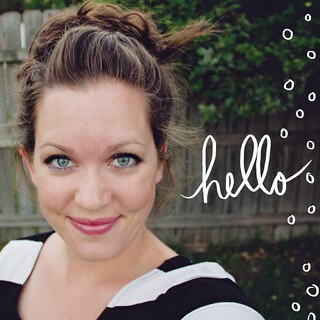 And you need to share your new schedule technique… anyone out here in the blogosphere would probably love to hear how other moms schedule in time to create and cook and clean (or not) and be a mother and a wife…all at the same time! now i just need a baby girl! 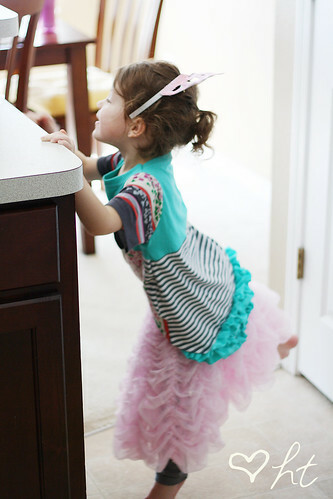 How cute, I have been wanting to take a skirt pattern for me and make a couple extra layers of ruffle in the bottom back… I will definitely stop back when I am in the process of making my skirt for tips on how to do it! This is so cute! 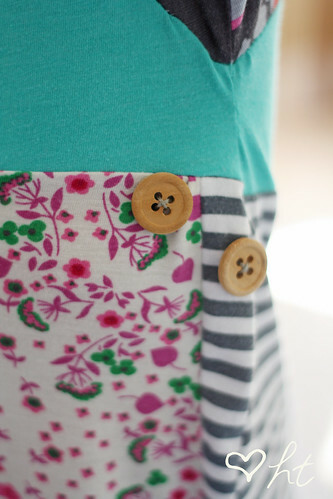 I love the fabrics you paired together and the cute buttons you added. What a beautiful dress. You are so so creative. 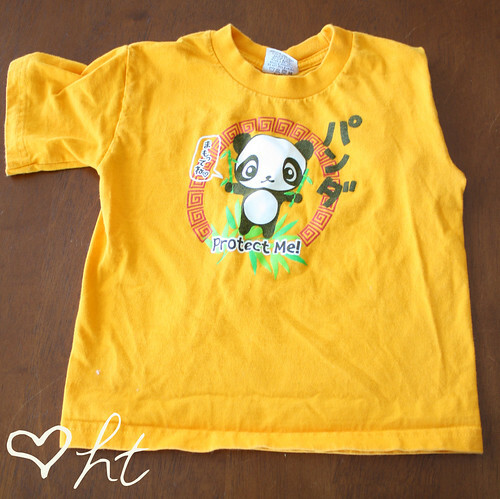 okay i totally want this in adult size!!!! i LOVE it! 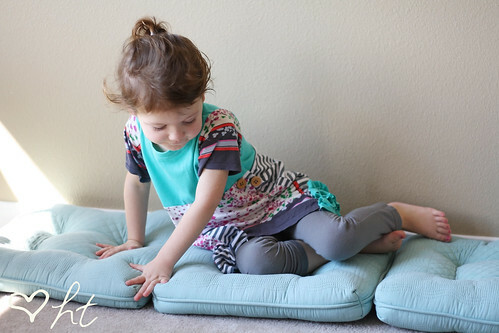 I saw this over on I heart Naptime…and I absolutely love it!!! So cute!